There’s sort of a hierarchy when it comes to the major North American animation studios. At the top, obviously, is Pixar Animation Studios who, despite a few recent missteps, has consistently maintained the best quality over the last 20 years. Next up is probably DreamWorks Animation who uses the law of averages to their advantage by throwing as many movies at the wall per year as possible and hoping at least one of them will stick (I’d say they have a one-in-three success rate which averages out to about one good one per year). Right now I’d argue Walt Disney Animation Studios is holding up the third place slot, but if their recent streak of successes continues they could easily overtake DreamWorks in the next few years. After those three, with a few notable exceptions*, you start to fall into the realm of bad to mediocre kids’ movies from companies like Sony Pictures Animation and Illumination Entertainment. Blue Sky Studios is arguably the best of the second-rate animation companies, and that brings us to the subject of this review: Epic. I do feel a little bit bad calling Blue Sky “the best of the second-rate studios” because, in fairness, they have made some pretty decent films (though, never anything I’d classify as “very good”). The first Ice Age movie was fun enough and their take on Horton Hears a Who! is probably the best feature length Dr. Seuss adaptation yet made (though, that’s not exactly a difficult accomplishment). The problem, however, is that literally half the films Blue Sky has produced are Ice Age films, each with diminishing quality. So how does their newest film, Epic, stack up? Not very well, to be honest. 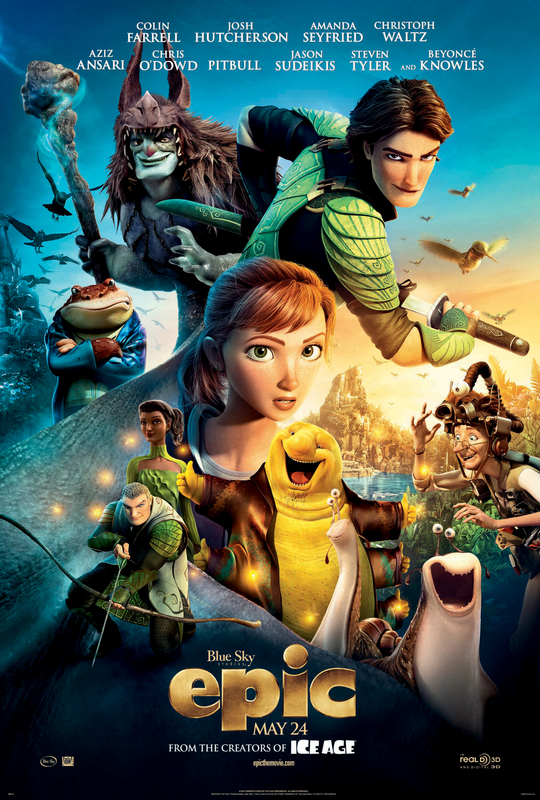 Epic is a loose adaptation of William Joyce’s infinitely better titled children’s book The Leaf Men and the Brave Good Bugs**. It focusses on teenage Mary Katherine (“M.K.”) who travels to see her estranged dad who lives alone in a house deep in the forest where he pursues his eccentric research. See, M.K.’s father believes that there is an entire society of tiny people living in the forest, helping to keep the forest alive, but in pursuit of this research he’s managed to alienate his family. When M.K. arrives it quickly becomes apparent why this is; he’s far more interested in his research than he is with his daughter who he hasn’t seen in years. Frustrated, M.K. decides to return home, but as she’s leaving she happens upon the Queen of the forest who has been shot by the evil Boggans on the day she was to choose an heir. With her last breath, the Queen shrinks M.K. down to her size and tasks her with protecting the bud that is supposed to sprout that night under the full moon to become the new Queen. One thing I will say in favor of Epic is that it is a very pretty movie. The art design is spectacular and the framing of the animation takes full advantage of this gorgeous world. It also has some surprisingly well executed action scenes that have a nice flow to them and taken on their own work better than a lot of your big-budget action blockbusters. The 3D also, as is typical with animated films, does a good job drawing you into this world and does really enhance the visual experience. There’s also a fairly nice score from Danny Elfman, though it’s far from the best work he’s ever done. And that’s about all the nice things I can say about this movie. It’s a shame, because the premise of the movie isn’t a bad one, and as I mention they really do pull out all the stops when it comes to the visuals, but after that they fall into a lot of the typical traps that befall animated kids’ films. One of the film’s most obvious failings is in its voice cast. All too often animation studios try to court name talent for animated pictures and in many cases, including this one, the voices of these star actors fail at bringing these animated characters to life. Obviously I am not saying that name actors are never a good fit for animation, I’m sure we can all list cases where it’s worked marvelously, but if you look at Pixar most of their films have very eclectic voice casts. You have everyone from major stars like Tom Hanks to animators and story artists that fit the character so well as a scratch voice that they didn’t bother looking for anyone else. It’s clear that the voice of the actor meshing with the voice of the character is far more important than what the actor’s name is. On the other hand, take a look at the poster for Epic. There’s no less than ten actors’ names headlining the poster and of those ten maybe two or three of them are actually any good. I mean, for god’s sake, Pitbull is a headlining name on this movie! Pitbull! Nobody wants to hear Pitbull when he’s rapping, why would anyone think we’d want to hear his voice come out of a toad?! In addition to Pitbull (whose character I wished terrible things would happen to every time he opened his mouth), there’s Beyoncé who is atrocious for every moment of the brief amount of time her character is in this film, and Steven Tyler who is spared from being the worst voice in this movie thanks only to his co-stars Pitbull and Beyoncé. Aziz Ansari grates as a cocksure, womanizing slug while Colin Farrell gives his very best “I’m collecting a paycheck” performance. Christoph Waltz is occasionally over-the-top enough to bring life to his character, but for a lot of the movie even he can’t overcome the terrible dialogue he’s made to read. Amanda Seyfried, Josh Hutcherson, and Chris O’Dowd are all fine in their roles, but still don’t have much life to them while Jason Sudeikis as M.K.’s eccentric father is probably the best of the bunch, essentially channeling Professor Frink from The Simpsons. In addition to the uninspired (and often downright bad) voice casting, the film’s story is completely without any life or momentum to it. Characters plod along from one plot point to the next, often taking unnecessary detours and going off on random tangents in a way that effectively destroys any sense of pacing the film might have had. I’ve said before and I’ll say again that it’s unfair to criticize a screenplay without having read it, but with five different credited screenwriters I would be surprised if the script was any less of an incoherent mess than the film is. Ideas are introduced only to be abandoned minutes later as the film changes focus to something else entirely, and this scattershot storytelling makes the whole thing a tremendously boring slog. All the while you are subjected to embarrassingly stupid humor that anyone above the age of 7 will find torturous. With everything from the production design to the ostentatious – yet ultimately bland – title, it’s clear that Blue Sky really wanted Epic to be a game changer for the studio, one that would make people take notice and begin taking them more seriously. The problem, though, is it’s all superficial. The gorgeous visual wonder of the film means nothing if the story taking place is plodding, predictable, and unfocussed. The attempts at sweeping scope and grand action fall apart when you fill the movie with terrible voice actors and silly grade school humor. The attempts at a heartwarming story of an estranged father and daughter reconnecting falls flat when the film itself is completely without heart. That last one is probably the film’s worst offense. The annoying jokes, the bad voice acting, and the half-baked narrative are all bad, but in the end, the fact that there’s no heart to this movie is what really kills it. There’s no warmth, no joy, just a cold, made by-committee production that fails to grasp why the movies it openly rips off captivated audiences before. There’s really no way I can recommend this film, it’s pretty, but other than that it has nothing going for it. If you’re looking for a good movie based on a William Joyce story you’re better off picking up last year’s wonderful, yet sadly overlooked Rise of the Guardians. Or better yet, watch Joyce’s excellent animated short The Fantastic Flying Books of Mr. Morris Lessmore. Both are beautiful films that are fun, engaging, and have infinitely more heart than Epic could have ever hoped to have. *Aside from a few one-off films like Fantastic Mr. Fox and Rango, LAIKA is mainly what I’m referring to here. The fact that they’ve only had two major releases so far means they can’t really compete yet with the Pixar/DreamWorks/Disney trifecta, however both Coraline and ParaNorman are excellent and I suspect LAIKA will start becoming a major player over the next several years. **Joyce just can’t catch a break when it comes to the titles of film adaptations of his books. The Guardians of Childhood is a much more interesting and evocative title than Rise of the Guardians (a title which many people associated with Zack Snyder’s awful talking owl movie), and while Blue Sky initially considered calling this film The Leaf Men, they ultimately settled for the non-specific blandness of Epic. At least Disney didn’t choose a completely terrible title when adapting A Day with Wilber Robinson.